Power Sharing in Iraq: Lipjhartian or Horowitzian Approach? This paper discusses power sharing arrangements in post-war Iraq in light of two relatively controversial theories namely, consociational (Lipjhartian) and integrative (Horowitzian) approaches. Firstly, I will recapitulate these two theories and then question to what extent are they applicable to the Iraqi case. Secondly, I will identify the problems of these two frameworks by relating them to the Iraqi case. Finally, I will conclude as neither of these two frameworks could offer exact remedies and lacked certain characteristics in terms of political design. The Lipjhartian model aims at finding out a solution to fragmented politics by providing the means of firm grounds to pursue policies to every party of the society. Lipjhart argues that consociationalism is the only viable option for democracy in divided societies(Lijphart, 1977). There are four characteristics of consociational model which are summed below. The most important one, says Lipjhart, is the government by a grand coalition of political elites which includes the all-important parties of the plural society. The second element is the mutual veto concept which intends to provide security to minorities’ interests. The third segment is proportionality which refers to the principal standard of political representation. The fourth and the last one is a significant degree of autonomy for each group which allows them to conduct their internal affairs. On the other hand, Horowitz offers five tools to reduce ethnic conflicts(Horowitz, 2000). The first mechanism is dispersion of power which proliferate points of power so as to make the heat off a single focal point. The second one is devolution of power and reservation of offices on an ethnic basis in order to encourage intra–ethnic competition at the local level. The third tool refers to inducements for interethnic cooperation. The fourth element highlights the need for policies to encourage alternative social alignments. Finally, Horowitz mentions distribution of resources as a way of reducing disparities between groups. These two theories have flaws and, in practice, do not have full explanatory power which will be explained in the following sentences. Before going through the differences between these two theories, I would like to highlight the overlapping and parallel points. To Sisk, the consociational and integrative models both support federalism and underline the significance of proportionality and ethnic balance(Sisk, 1996). The first criticism regarding the consociationalism is its remarkable reliance on political elites as regulators of the conflict(Sisk, 1996). There is concrete evidence which undermines Lipjhart’s claim; peace may not endure without grass roots backing though the political elites’ initiatives. Furthermore, there is no guarantee that political elites will agree on grand coalition and there have been inter-elite and elite-initiated clashes which show us the flaws in viability of this mechanism. Nevertheless, McGarry and O’Leary supplement this approach by showing us grand coalition may be overstated and they argue ‘‘what makes consociations feasible and work is joint consent across the significant communities, with the emphasis on jointness’’(Wolff & Cordell, 2011). On the other hand, despite its broad approach Horowitz is criticized for the scarcity of concrete examples of his approach. This point is significant since at the time of writing- 1985- only two examples existed and the late example of Northern Ireland did not prove fully the theory. The second criticism of the Lipjhartian model is the problem of inter elite and elite initiated conflicts(Sisk, 1996). Citing Tsebelis (1990), Sisk argues that elites may lead conflict along group lines to improve their position in the political arena. Recent developments in Lebanon proved this point. However, the integrative model is criticized for its approach on how to structure the core institutions and core executives. Many scholars agree that the election of the president and that of the parliament members should be structured according to specific requirements of certain countries since there is no another Mandela (Reynolds, 1995; Sisk, 1996, 2008). In the same vein, critiques of the Lipjhartian approach underline the lack of incentives for building bridges between conflicting communities which undermine the proportional representation model(Horowitz, 2000; Sisk, 2008; Wolff, 2009; Wolff & Cordell, 2011). Horowitz, who offers the use of the Single Transferable Vote or Alternative vote, faced criticisms since ‘people may be unwilling to vote for candidates who are not from their community’ (Sisk, 1996, 2008). As well as not offering incentives, regarding the federalism phenomenon the Lipjhartian model may contain disincentives which prevent groups to live peacefully together (McGarry & O’Leary, 2006; Sisk, 2008) The veto power of a minority group which does not have a “significant” proportion of demographics or constitute an inconsequential territorial entity may be unproductive and cause vicious circles(Wolff, 2009). On the other side, federalism may be a viable choice for the political context but political leaders or elites may not respond to moderation efforts which makes the minority representation symbolic(Sisk, 2008). Iraq was invaded and occupied by American forces in March 2003 which later resulted in sectarian strife and instability which still dominates the politics of the country. The power sharing arrangements in the country aimed at building peace under the auspices of the United States which coordinated the ‘state building’ process. The Transitional Administrative Law(TAL) was legislated to be interim however well informed observers argued that it was a constitution(O’Leary, 2005). One point regarding this constitutional document should be highlighted; TAL argued that a new constitution which ‘will be ratified if a majority of the voters in Iraq approve and if two-thirds of the voters in three or more governorates do not reject it’ (TAL, Article 61). This article accepts de facto situation of the Kurdish governorates in the north of the country and signals the federal position of the Kurdish region. Federalism was reflected in the TAL as follows ‘the system….. shall be….. federal and powers shall be shared between the federal government and the regional governments, governorates, municipalities, and local administrations’ (TAL, Article 4). Before going through the power sharing arrangements, one should question to what extent these theories are applicable to the Iraqi case. First of all, federalism is an overlapping point in both approaches and is applicable to the Iraqi case since the Kurdish region is federal –though the meaning and the extent of the federacy remains ambiguous and the state seem to be a federal edifice with a strong central government. Secondly, the issue of proportionality is significant in the Iraqi context since the election results illustrated the balance along the ethnic lines. Despite some different aspects and problems of the power sharing arrangements, there is clear evidence which shows us that we can discuss these models in this case. Although the large number of the elites in the Iraqi government (42 ministerial positions) seems to be representing the grand coalition notion of Lipjhart, the distribution of the seats refer to the Horowitzian approach which supports dispersion of power in order not to create a single focal point. In the 2010 elections, the Iraqiya bloc led mainly by Ayad Allawi and Tariq al-Hashimi won 93 seats in the 325 seat parliament while the State of Law bloc led by incumbent prime minister Maliki won 89 seats, and the Iraqi National Alliance and the Kurdistan Alliance won 70 and 43 seats, respectively. As it is seen, these blocs show there is no unity between the Shi’ites, the Sunnis and the Kurds since Allawi is a secular Shi’ite elite, or the American puppet in the popular saying, while Hashimi is a conservative Sunni and Maliki is a secular Shi’ite. However, The Kurds, with 57 seats in the new 325-member Parliament, emerged as powerbrokers in the final talks, throwing their support behind Mr. Maliki as prime minister in exchange for holding onto the presidency. Nevertheless, since the proportional distribution of the votes did not allow any party or bloc to lead the government, Tariq al-Hashimi was appointed as the Vice Prime Minister after long negotiations(Abdul-Zahra & Surk, 2010). The proportionality issue is also considered in the Iraqi constitution regarding the formation of the institutions. 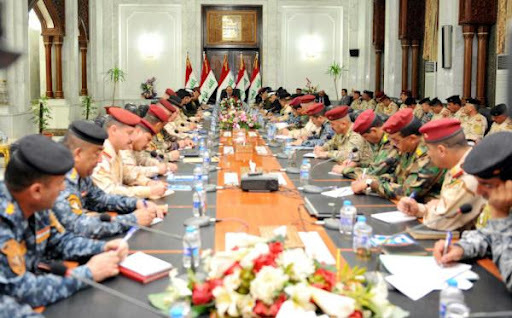 For example, in terms of the military composition, the constitution argues ‘The Iraqi Armed Forces and Security Services will be composed of the components of the Iraqi people with due consideration given to its balance and its similarity without discrimination or exclusion and shall be subject to the control of the civilian authority’(Government, 2005). However, there is no evidence if this principle is applied in the real life. Furthermore, it is ambiguous how this principle will be implemented and there is no rule to regulate the conflictual situations. The second important concept in Lipjhart’s model is the mutual veto arrangement. However, in the Iraqi case we do not see such veto arrangements. Instead, granting offices along ethno-religious lines, as asserted by Horowitz, implemented to some certain extent. The distribution of the ministries is a crystal clear evidence of this phenomenon. However, at the local level, there is no clear evidence if this principle has been implemented. Nevertheless, the recent instability and conflicts among the members of the government and some other political elites shows Horowitz’s argument is not valid always since such arrangements does not necessarily encourage cooperation but instead may cause political conflict. Furthermore, the recent power struggle of the political elites proves that a powerful political leader may gain support but also may drag the country along the chaos(Arango, 2011). Having mentioned the proportional representation of Lipjhart, I would like to elaborate on Horowitz’s principle on ‘inducements for interethnic cooperation’. Though the United States tried to bring together all influential groups and invited them to cooperate, the cooperation was limited. The carrots, -providing security, launching civic and military educational programs, economic aid and etc. – did not work which shows us that post-conflict arrangements may not be influential if old enemies’ emotions are not healed and their interests are not moderated very well. Reconciliation process is as important as constitutional and governmental issues. Lipjhart highlights the need for a significant degree of autonomy which will allow groups to regulate and conduct their internal affairs. In this case, the Kurds has a significant degree of autonomy since the region was given federal status and their language one of the two official languages of the country. Despite the constitution guarantee to all groups regarding their language and religion, it seems unpractical since the Armenians, the Assyrians and the Turcomans may not have the opportunities to open private education institutions or practice their religion. The fourth element in Horowitz’s model reflects the need for creating alternative social alignments. Though different socio-politic alignments emerged as a result of the Maliki’s radical move from the Shi’ite bloc, no productive result has been achieved. Furthermore, the implementation of top-down policies resulted in corruption and remained inefficient(Ben-Meir, 2007). This shows the importance of bottom-up processes and the rightness of Horowitz on sociological level. It is also important to highlight the deep hostile boundaries between top-level officials regarding key security issues. Important security arrangements were changed without giving any information to the Deputy Prime Minister(Francke, 2007) which continued in the new government’s era. The last principle of Horowitzian model underlines the importance of the distribution of the resources. However, in the Iraqi context this principle is not a source of reducing conflict rather source of a striking conflict. The status of the oil produced in the Kurdish region created many problems between the central government and the regional authorities. The main struggle has been over the permission which will be given to the western investors(Alkadiri, 2010). The central government insisted that it has the power to issue such permission and threatened the companies not to give permission to produce raw oil in any other provinces of the country if they do not respect its decisions. Though the central government seems to be on the winning side, the controversy is ongoing and the recent political climate may exacerbate the relationship. The above mentioned problem reminds the students of political science the issue of federacy which constitutes one of the fundamental problems of power sharing in the Iraqi case. As I mentioned above, Kurdistan is a federal region. However, the content of regional federal government’s authorities remains ambiguous since the Shi’ites and therefore the central government wants to have more power in the region. The constitutional design is not detailed regarding the issue and problems have arisen over the time. Furthermore, the status of Kirkuk is still disputed and the issue cannot be solved without considering the interests of Turkey, the U.S., the Kurds and other political parties of Iraq and Iran. Kirkuk also reflects the need for Territorial self-governance which can be defined as ‘the legally entrenched power of territorially delimited entities within the internationally recognized boundaries of existing states to exercise public policy functions independently of other sources of authority in this state but subject to its overall legal order’(Wolff, 2010). Last but not least, the Shi’ites perception ‘demography is democracy’ is one of the most significant problems of power sharing in the country. Majority does not necessarily guarantee a working democracy, especially in such fragile countries. If the perception of the Shi’ites does not change, a bloody conflict may soon emerge among the different communities in the country. In accordance, as I mentioned above, contemporary societies does not have many unifying leaders. In Iraq, the Prime Minister Maliki challenges the power sharing arrangements by trying to empower the central government and the secular Shi’ite bloc. His attempts, as we are experiencing in the recent Hashimi case, provide fertile grounds for the breakdown of the country. In sum, the models offered by Lipjhart and Horowitz help us to explain the Iraqi case to a limited extent. The Liberal Lipjhartian approach developed by McGarry and O’Leary fulfills the gaps of between the grandiose claims of Lipjhart and the practice. However, even this approach does not help us much to explain the power sharing arrangements in the country since the power sharing arrangements in the country are complex. To understand the political design of the United States- which is an external power and neither of the theories mention external intervention-and the socio-political imagination of different ethno-religious communities a new power sharing model is needed. Furthermore, the elite initiated clashes contradict both Lipjhart and Horowitz and makes the issue difficult to provide a solution. Last but not least, instead of relying much on political elites backing bottom-up approaches which may force the political elites to cooperate can be an alternative in this case. Alkadiri, R. (2010). Oil and the question of federalism in Iraq. International Affairs, 86(6), 1315-1328. Francke, R. A. R. (2007). Political Progress in Iraq During the Surge. Washington DC: United States Institute of Peace. Government, I. (2005). Final Draft Iraqi Constitution Baghdad: Iraq Government Retrieved from http://portal.unesco.org/ci/en/files/20704/11332732681iraqi_constitution_en.pdf/iraqi_constitution_en.pdf. Horowitz, D. L. (2000). Ethnic groups in conflict (2nd ed.). Berkeley: University of California Press. Lijphart, A. (1977). Democracy in plural societies : a comparative exploration. New Haven: Yale University Press. McGarry, J., & O’Leary, B. (2006). Consociational Theory, Northern Ireland’s Conflict, and its Agreement. Part 1:What Consociationalists Can Learn from Northern Ireland. Government and Opposition, 41(1), 43-63. O’Leary, B. (2005). Power-Sharing, Pluralist Federation and Federacy. In B. O’Leary, J. McGarry & K. Salih (Eds. ), The Future of Kurdistan in Iraq (pp. 47-91). Philadelphia: University of Pennsylvania Press. Reynolds, A. (1995). II. The Case for Proportionality. Journal of Democracy, 6(4), 117-124. Sisk, T. D. (1996). Power sharing and international mediation in ethnic conflicts. Washington, D.C.: United States Institute of Peace Press. Sisk, T. D. (2008). Power Sharing after Civil Wars. In J. Darby & R. Mac Ginty (Eds. ), Contemporary Peacemaking (pp. 195-209). New York: Palgrave Macmillan. Wolff, S. (2009). Complex Power-sharing and the Centrality of Territorial Self-governance in Contemporary Conflict Settlements. Ethnopolitics, 8(1), 27-45. Wolff, S. (2010). Governing (in) Kirkuk: resolving the status of a disputed territory in post-American Iraq. International Affairs, 86(6), 1361-1379. Wolff, S., & Cordell, K. (2011). Power Sharing. In S. Wolff & K. Cordell (Eds. ), Routledge Handbook of Ethnic Conflict (pp. 300-309). New York: Routledge. See (Wolff, 2011) for more information on this approach.